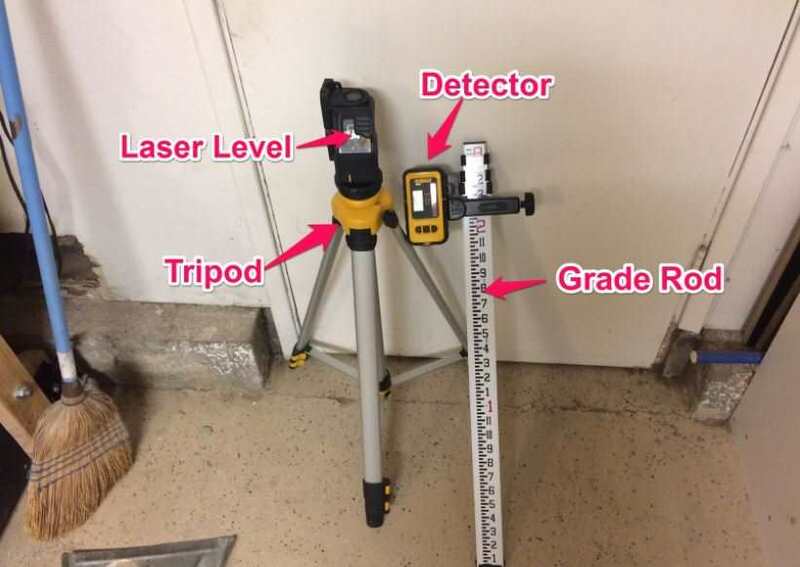 Grading with a laser level is now so easy: indeed, one of the best things that has happened to construction, whether it be professional or amateur, is the laser level. The simplest form of the laser level is the dot generator, which is like it sounds, generating a dot for measuring. One peg higher is the line laser, which makes a nice level line, either horizontal or vertical. You can also get cross beam or multi-beam line generators. All of these but the dot generator are adequate for leveling. You can then go a bit farther with a rotary laser level. As the name implies, this unit spins around, and that can help you level outdoors, even without a buddy. So, if you have a grading project, go it’s important to use a with a tripod when grading with a laser level. Grading is, essentially, smoothing land to a particular angle, which can include completely flat. It’s just the process of working on the ground to get it how you want it, rather than just building around rolling or unsteady land as is. Usually leveling is done for outdoor projects, with one example being laying a foundation. When a foundation is poured on leveled ground, less water or moisture of any kind will accumulate on it. Other projects that include flatness, like putting in a basketball court are also big grading projects that demand the accuracy only a grading with a laser level can give. Now, as mentioned above, grading basically means evening out land, taking out rolls or lumps. That doesn’t mean that when you grade a surface it has to be flat. You can grade a surface so that it slopes upward or downward—just on a steady angle. While you want the ground under a house’s foundation to be flat, you are going to want to grade the land all around to slope away from the house, to keep water from running to the foundation. Laser level- plenty of reviews abound to help you choose a high-quality laser level within your budget. Grade Rod- a grade rod is meant to work in conjunction with a laser level. It’s a long rod, often of aluminum, that helps to measure differences between one end of a grade and another. Laser Detector- This is a handheld device that reads the beams of either type of laser level—red or green. It has a digital display that shows the location information for the beam. Now, here are the steps for grading with laser level. Place your tripod on a hard surface that is completely dry. You don’t want gravel or slightly moist grass or anything that will allow the tripod to wiggle or sit unevenly. Be sure that the distance between all the three of the legs is equal. It’s worth taking a minute or two to attend to this detail, because it’s really not a detail at all. Activate the laser level and allow it a short time to self-level. Find the height were you want the grade to be. Place the grade rod at that height. Aim your laser beam at that point and have your partner maneuver the laser detector to find the beam. Adjust the laser detector as needed. You’re looking for a constant beep, rather than a spotty one. You’ll get a sporadic beep when the detector is either too high or too low. Now it is time to take readings at various points with the grading rod. To do this set the rods at strategic points, more or less evenly spaced. Getting readings this way will let you know if the ground is too low or too high at a particular place. This lets you know whether the ground is too high or too low, and you can cut or fill accordingly. Set the rod in the ground in a way that is steady and firm. The bottom of it sets the level of the grade. Place a post in the right location to mark the spot. It’s very important to get high accuracy when grading any surface. It’s a level of accuracy that requires a laser level, and that only grading with a laser level can give.